This is Part 2 of Battle of the Recipes between Chef Mario Batali and Chef Warren Geraghty. If you've missed Part 1 -- The Battle, click here. Starting tomorrow, TS and JS will be away from their kitchen for about 2 weeks. In the meantime, they leave you this, the conclusion to their special presentation of Iron Chef -- Battle of the Recipes. Internet access will likely be spotty, but they will try to publish a few posts, perhaps. They will try to keep up with all your food blog posts. However, comments may lag for quite a while. Thank you for your patience. Our regularly-scheduled programming will now resume. The first-ever Iron Chef --Battle of the Recipes (Part 1, The Battle) has just ended and now it is time to choose the victor. Here's Kevin Brauch to tell you how the judging works. Out of the 20 points for the main, 15 goes to taste and flavour and 5 goes to presentation. Out of the 10 points for the dessert, 7 goes to taste and flavour and 3 goes to presentation. We are not really giving out points for plating and originality because -- well, we are constrained by the recipe and the plating of the original Iron Chefs. For reference, please look at the pictures of the original dishes from the cookbooks. There they are at the top of the page. Batali's dishes form the first row, while the dishes from West form the second. The dishes made today certainly seem up to par with the originals. Chef faux-Gerharty, what was your inspiration for today's battle? Mackerel is one of the most underrated fish around. At the restaurant, most customers find it a pleasant surprise. 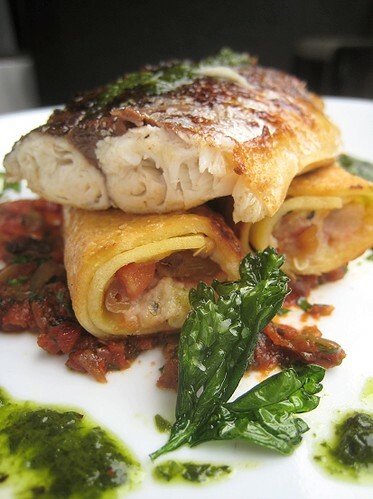 Here we have pan-fried mackerel sitting on top of cannelloni that has a filling of charred eggplant, tomatoes, tahini and pine nuts. We also have a slow-roasted tomato and shallot sauce, as well as a tangy parsley vinaigrette. And finally, we have some crispy-fried parsley lightly seasoned with salt. Enjoy. I love this roasted tomato sauce! How come there isn't enough of it on the plate? It is a good-looking plate, with all of the colours here, the red, the green, the brown. I don't like the fish piled on top of each other like this. Where else would he put the other piece? Maybe Chef Geraghty should have given you just one piece. Give me that other piece, then! Hands off! You can have my cannelloni, though. I didn't care for that at all. I didn't like it. You didn't like it? I thought it was very good. All the elements of this dish complemented each other well. The pasta was a very good foil for the oily fishiness of the mackerel. The parsley vinaigrette didn't really do anything for me. I thought it added a welcome acidity to the dish, much more so than the tomatoes, which were sweet. Give me that cannelloni, if you don't want it. While Chef was filling the cannelloni, I thought there was too little filling for the dough. Turns out it was just right! Who was I to doubt, eh? I love the chewiness of the pasta. The filling had a nice smokiness from the eggplant. My only complaint was that the pine nuts seem disproportionately big for the rest of the elements. Maybe they should have been chopped finer. 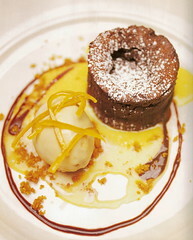 For the dessert, it was a simple concept of chocolate and coffee. 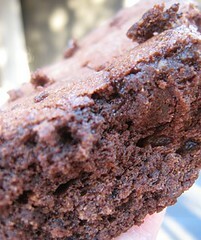 This is a dark chocolate cake flavored with espresso. 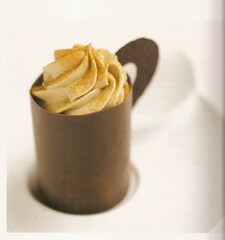 It's layered with espresso whipped cream and wrapped with dark chocolate. 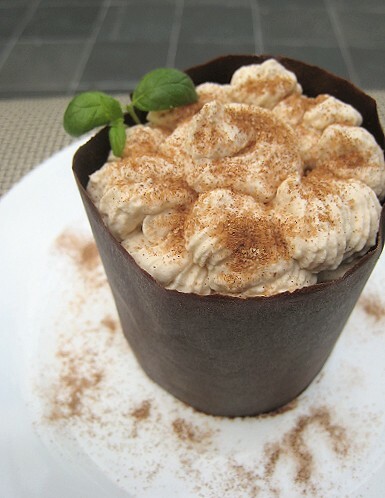 Finally, it is finished with a sprinkling of cinnamon sugar. Enjoy. I find the texture of the cake to be too soft. Or mushy. It is also a tad bitter to me. Conceptually, I can see that this is well-thought out and a "complete" dessert. But the flavour just isn't there. 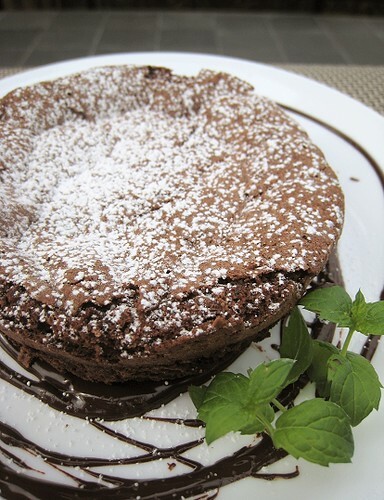 It is one-note to me and I have to eat with the chocolate outside to gain a more substantial flavour from the cake. It is bitter to me and I couldn't quite get where the bitterness is coming from. Is it from the coffee or from the chocolate? I don't get the bitterness you're mentioning. The cake is too flakey, too dry for me. It just disappears in my mouth and there seems to be no lingering flavour there at all. Yes, it is a little dry. You have to eat all of the layers as one bite. The cream adds more of that body, the mouthfeel. I don't know why there was no flavored syrup to soak the cake rounds. I think that's usually what's done with a cake of this type. This is just so dry. Or mushy. It's dry and powdery, or mushy. I don't know. I'm confused. I just don't like this. The look of it was nice, but the taste was very disappointing. Sorry. Chef Faux-Batali, what is your inspiration for the dish? 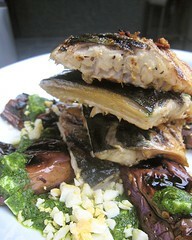 I wanted to showcase the mackerel's inherent oily deliciousness, pairing it with the sweetness of grilled eggplants. Those have been marinated in olive oil, oregano, red pepper flakes and red wine vinegar. 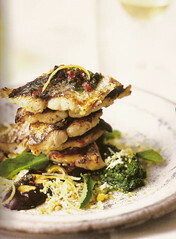 The salsa verde is for that burst of herbacious greenness and freshness, which wouldn't go badly with the fish either. It has parsley and a little mint, with anchovies, olive oil, capers, lemon zest and juice, and hardboiled eggs. Enjoy. I love mackerel on its own, but having it with the eggplant was delicious. 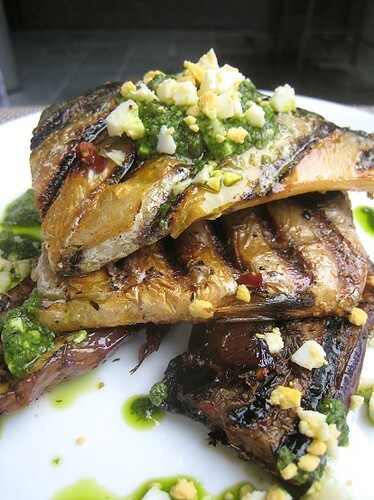 The grilled eggplant is sweet, almost banana-ish. I didn't like the eggplant at all. It tasted burnt to me. I had a problem with the eggplant skin, but I love the marinade on the eggplant, especially the acidity and the heat, which kicks in a little bit after you swallow the eggplant. The mackerel could have used a little more salt. More seasoning is in order. But overall, I thought this dish was very, very good, and I'd happily order it in a restaurant. I'm sorry to say, but I did not like this dish. I wanted to like it. When I say the grill marks on the fish and the eggplant, I was extremely excited. What didn't you like about the dish? I couldn't taste the mackerel at all when eaten with the sauce. Now, don't get me wrong, because I liked the salsa verde. It had a nice tang. I would happily eat the mackerel and the sauce separately. Taken together, I just found the dish disappointing. You didn't like the eggs? I was very happy to see the eggs. Maybe that's just me. It didn't add anything for me. The salsa verde overpowered everything, in my opinion. I thought the salsa verde was delicious! It was punchy, very bold, it was fresh, and that little bit of mint just gave the sauce just a different unexpectedly delicious dimension. I didn't like the mint at all. I couldn't put my finger on it, but maybe that's what I didn't like about it. The only thing I can complain about the salsa verde was the colour. The green was overpowering for me, presentation-wise. The plate could have used a little more colour. For the dessert, well, what can I say? The dessert is simple. I love chocolates and I love hazelnuts together. They're a match made in heaven. Enjoy. 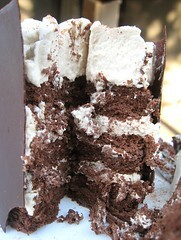 I like the texture of this cake and I love the contrast between the crusty outside and the soft, fudgey interior. I would pair this with a simple vanilla ice cream and it would be great! I like the little nuts in the cake. The chocolate is "just right," not too bitter, not too sweet. Yeah, flavour-wise, I liked the fact that it was not too sweet. The chocolate flavour really comes through, as well as the hazelnut flavour. I mean, it's still fairly light, yet very fudgy at the same time. And the flavor is nice and bold. I thought the hazelnuts were a tease! The bits were too small. I could have used bigger pieces of the hazelnut. But I liked it overall, although it was on the dry side for me. And I think the plating could have been better. Really. I thought it was simple and classic. The judging is now complete. Now, the verdict! Today, at Kitchen Stadium, we meet two duelling sisters channeling two culinary masters, Batali and Geraghty of West. Both of them have fought long and hard, but there can only be one. Will it be Mario Batali's bold Italian flavors? 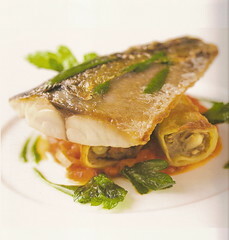 Or Warren Geraghty's more refined dishes? Who will it be? Whose cuisine reigns supreme? Here's how it went down. The scores from the judges were averaged and each chef had one aggregate score. Batali's total comes to 22.75/30. West's total comes to 20.33/30. So there you have it, ladies and gentlemen. Although Chef Geraghty wins hands-down on presentation, and both mackerel dishes did well, in the end, it was West's dessert that let them down. Our first-ever Iron Chef, Battle of the Recipes is now complete. Until the next time, on behalf of all of us at this Kitchen Stadium, we wish you good eats. Oh wait, that's my other show! Jeez, this post made me howl - particularly the judges! I think making other people's recipes for the Iron Chef Vancouver (sweet!) competition was a great idea, because I know that personally my own fragile self-esteem would never stand up to such rigors! Excellent conclusion (well done Depalma)! Sorry to hear that the first cake was a total letdown. The presentation is gorgeous, though. Have a happy 2-week vacation, you guys!! Very nice presentations! Thanks for a great post! What a hilarious post! I hope you guys have a nice trip. I'll look forward to seeing what you bring back. Wonderful job! Thanks for doing this. Mario always wins! You had me laughing through both posts. Have fun with your time off, after all this work you deserve it!